Fill out the form below to send your Gift Card request. Your gift card will be mailed to the address entered below. 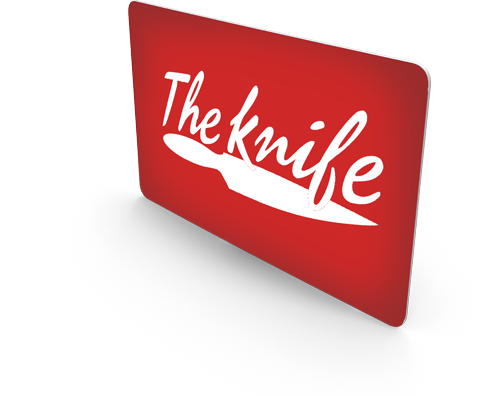 The Knife Restaurant gift cards are valid for all food and beverage purchases within the restaurant and do not expire. Gift cards are NOT VALID for cash back and cannot be applied to gratuity. Holiday gift card promotions are not available in store. Please contact the corporate office directly for assistance, Mon.-Fri. 9:00 AM to 5:00 PM CST at 786-866-3999 For your protection, orders are shipped via FedEx. Physical address required. P.O. boxes will not be accepted. Orders placed after 3:00 PM CST will not be processed until the next business day. The Knife Restaurantl is not responsible for lost/stolen packages and/or delivery delays due to weather. Gift cards are not valid for cash and cannot be applied to gratuity. Gift cards purchased online or at a domestic The Knife location are NOT REDEEMABLE in Puerto Rico and Trinidad international locations.